Hotel Zubrowka has been built of traditional ecological materials such as stone, bricks and timber. Vast amount of unique architectonic details made of natural materials are combined in perfect harmony with the modern technologies. The hotel finish items utilise timber, stone and forged metals. The hotel is situated away from the noise of main roads and provides its guests with comfort and allows full contact with immaculate nature. Located at the entry to Białowieza National Park it consists a quiet and peace enclave thus giving the comfort for work and leisure. This is also an object perfect for family recreation - with peaceful apartments and friendly atmosphere. This is also an ideal place for the conferences, symposia and various types of integration events with the back-up facilities such as additional services rendering the stay in Białowieża unforgettable. 106 one- and two-person rooms (also for the disabled and non-smokers) furnished with telephone, TV sat, Pay TV, wireless Internet, minibar, hair dryer, robes, towels, disposable slippers and electronic door opening and lighting system. 6 Luxury Apartments: Apartments Royal and Tsar fitted with inter alia fireplace, bar, balcony with a view onto to the Forest, Presidential's Apartment with two spacious bedrooms and lounge and two air-conditioned apartments: Duke's and Senator's Apartments. 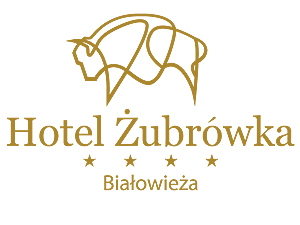 At the disposal of guests, the Hotel Zubrówka offers a total of 112 rooms. The facilities can accommodate even 250 people at one time. Zubrówka Restaurant consisting of three rooms: Main Hall, Hunters Hall and Banquet Hall. Conference Centre for 500 persons provided with top class audiovisual equipment and free of charge wireless Internet connection (Hot Spot). - Mega Sun Tower Solarium. A splendid complement to your rest will be a visit to our swimming pool complex, where waiting for you are a swimming pool and related attractions: resistance jets, hydromassage, paddling pool with attractions, dry sauna, steam sauna, infra-red sauna, water cave with attractions or a visit to the fitness room stocked with the latest equipment. The prices are VAT inclusive and climatic charge.